Charitable contributions are subject to a wide variety of special requirements. Only certain types of contributions to certain types of organizations are deductible for tax purposes. Furthermore, special substantiation and other compliance rules apply. 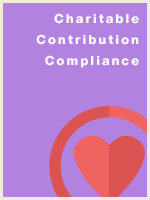 This course provides a description of these requirements and tips for making sure that an intended charitable contribution meets the standards for deductibility. Recognize the elements of a deductible charitable contribution. Differentiate between the rules applicable for contributions to public charities and private foundations. Calculate the charitable deduction when something is received in exchange for a contribution. Distinguish the charitable deduction limits applicable to individuals and corporations. Identify the special rules for vehicle donation.